Be the first to share your favorite memory, photo or story of Albin. This memorial page is dedicated for family, friends and future generations to celebrate the life of their loved one. 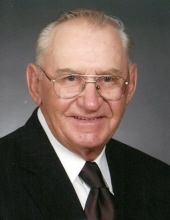 Albin F. Brandt, 90, Pittsville, passed away on Thursday, February 7, 2019 at Cranberry Court Assisted Living, Wisconsin Rapids. Funeral services will be held at 2:00 pm on Monday, February 11, 2019 at St. John’s Lutheran Church, Pittsville, where the visitation will be from 12:30 pm until service time. Rev. Gary Markworth will officiate. Burial will take place in Mound Cemetery and grandsons will serve as pallbearers. Buchanan / Rembs Funeral Home is assisting the family. Albin was born on December 20, 1928 in Arpin, to Raymond and Irene (Fell) Brandt. He attended North Hansen School. He started hauling milk to the Pittsville Creamery in 1944. He married Joyce Stillman on October 4, 1950 at St. John’s Lutheran Parsonage, Pittsville. She died on August 22, 2009. He continued hauling milk for 18 years and then went to full time farming. He enjoyed his John Deere collection, hunting and fishing. Albin is survived by his children, Susan Wolf, Dixie (Jeff) Jacobson, and Albin Brandt, Jr., all of Pittsville, Kaye (Steve) Hamm of Wisconsin Rapids and Lori (Scott) Nennig of Marshfield. He is also survived by 6 grandchildren and 12 great grandchildren, Scott Wolf; Amie (Jason) Gordon and their children, Haley and Hayden; Melissa (Phil) Julga and their son, Kamden; Janalee (Matt) Darr and their children, Brooke, Jayden and Dalton; Joseph (Crystal) Jacobson and their children, Talon, Kaylee and Logan; Julie (James) Brandenburg and their children, Avery, Jon and Aubrey. He is further survived by nephew Jim (Lorre) Mangrum of Grants Pass, Oregon. He was predeceased by his parents, his wife, Joyce, brothers, Alfred and Robert (Doris) and sister, Elaine (Russ) Mangrum, son-in-law, David Wolf and nephew, Robert “Bob” Brandt. The family wishes to thank the staff of Heartland Hospice for the wonderful care of their dad. Memorials may be designated in his name to St. John’s Lutheran Church. "Email Address" would like to share the life celebration of Albin F. Brandt. Click on the "link" to go to share a favorite memory or leave a condolence message for the family.